"This brilliant compilation gathers the complete vinyl recordings of Fela 1963-1968 and is a must-have! Fela Kuti (1938-1997) was the first and brightest African super star, and a music genious of colossal dimensions, considered by many the unrivalled king of African music for more than 30 years. What Vampisoul has the inmense pleasure to offer, as part of our ongoingg African sonic exploration (Tony Allen, Orlando Julius, Highlife collection and more to come), is the musical birth of a MYTH and GIANT of world's music. In 1970 Kuti changed his name from Fela Ransome Kuti to Fela Anikulapo Kuti ("Anikulapo" being a yoruba name meaning "he who carries death in his pouch"), and radicalized his music (inventing Afro-Beat!) and his vision of the world, joining forces with the Black Panther Party, forming the Kalakuta Republic (a commune which he declared independent from the Nigerian state), creating his own revolutionary political party "Movement Of The People", and rebelling against the military regime of Nigeria. What we're focusing here into, though, is what Kuti did in the 60's, between 1963 and 1969, years before naming his band Africa 70 and becoming the first african music rebel. After staying in London between 1958 and 1961, where he studied at the Trinity College of Music, and prior to his first visit to the States, when he knew about the black power movement, Fela was back in his Nigeria home with his band The Koola Lobitos serenading nightclubbers with jaunty highlife jazz and afro soul music. 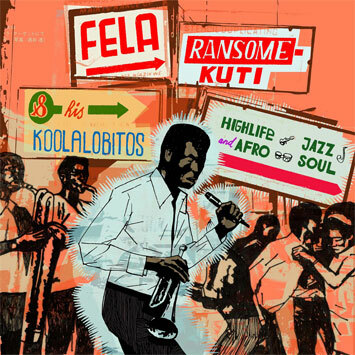 What you can hear in this compilation is Fela Ransome Kuti (not Anikulapo) and His Koola Lobitos, doing an irresistible, torrid and infectious rhythmic mix of West Africa's Highlife music, jazz, soul and funk. Licensed from The Fela Kuti Estate and Premier Records, this deluxe Vampisoul package, available both on double CD set and triple vinyl LP, features extensive notes by African specialist Max Reinhardt and artwork by artist Victor Aparicio. The vinyl version consist on two 12" LPs, and one special 10" LP, exact reproduction of Kuti's legendary 1966' "Afro Beat On Stage, recorded Live At the Afro Spot (PLP001)", with all the same songs, in its own jacket with original artwork, and liner notes! Le track list de ce CD est pas le bon... pourtant c'est celui qui est sur le cd et dans le livret mais tout est en desordre... t'as moyen de choper le vrai track list? Apparently the problem has been corrected on new copies and they're in stores now (or very soon).